Verdi’s La Traviata, one of the great operas in the standard repertory, is a centerpiece for a world class soprano with a large vocal skill set, quiver being a word open to misunderstanding here, but also for one who brings a keen sense of character, plus the ability to pull Violetta off dramatically as well. Diana Damrau is such a star. Brava! Her Violetta, as directed by Michael Mayer, wavers on the seesaw of joy, triumph and hope versus despair and death. Do I love this young fellow Alfredo? Do I open myself emotionally to a real love relationship and maybe find true happiness, possibly prolonging my life? Or do I accept the very real probability that the relationship is doomed by a number of factors, not the least of which are a lack of income, social rejection, his family’s rather explicit demands that I disappear, thus forcing me to return to my former hedonistic existence, which will almost certainly hasten my demise? Tough choices, these. As written, Violetta is a complex character, which, of course, raises the bar of ‘complete realization’ much higher than, say, Verdi’s Gilda. Damrau communicates Violetta’s ever-shifting emotions and thoughts with quick but fluid bursts of expression. Watch her: attend to her face, her hands, the quick changes in her posture and the overall energy level she exudes as each moment passes. Sure, sometimes she exaggerates, but it doesn’t really seem so. More importantly, she is never, as in never a moment offline on stage. Damrau’s singing is equally thrilling, big when called for, but also subtle, inward and smooth as silk as needed. Again, mille bravi! Alfredo is sung by a happily-returning-to-the-Met Juan Diego Flórez. He sings with his accustomed grace and sense of style, but one is aware that Verdi’s orchestra at times is not Donizetti’s orchestra, nor is the style of singing demanded always bel canto. Flórez, too, has a fine sense of character and stage presence; he and Damrau are a good match when their characters are closely, quietly in love, as in the heavenly Un di felice, eterea, their magical moment alone duet in Act I.
Quinn Kelsey is a sturdy sonorous Germont, his Di provenza il mar was roundly applauded. The Baron Douphol is sung by veteran baritone Dwayne Croft; Flora Bervoix is Kirstin Chávez, Annina is veteran Met star Maria Zifchak. Others include Jeongcheol Cha as the Marquis d’Obigny, Kevin Short as Dr. Grenvil, Scott Sulley as Gastone, Marco Antonio Jordäo as Giuseppe, and Ross Benoliel as a Messenger. Michael Mayer’s conception of Traviata may raise eyebrows in some spots, but on the whole it’s more or less a traditional staging, for one big point, actually set in Paris, therefore already more traditional than his Las Vegas Rigoletto from 2013, with the glitz of the casinos, the elevator, and, in the end, Gilda’s body stashed in the trunk of a car. This La Traviata is updated to the 19th century, markedly so in Christine Jones’ sets and Susan Hilferty’s costumes, each possibly misinterpreting Violetta’s opening line as Floral, amici, as in “yo, my dear friends, give me lots of flowers”* instead of Flora, amici, as in “yo, Flora, friends…” and so on. The costumes are in the bright pastel colors, the flowers that bloom in the spring, summer, with vines and trellises, even a huge complex actually quite interesting ball of flowers hanging above the stage in Act I. 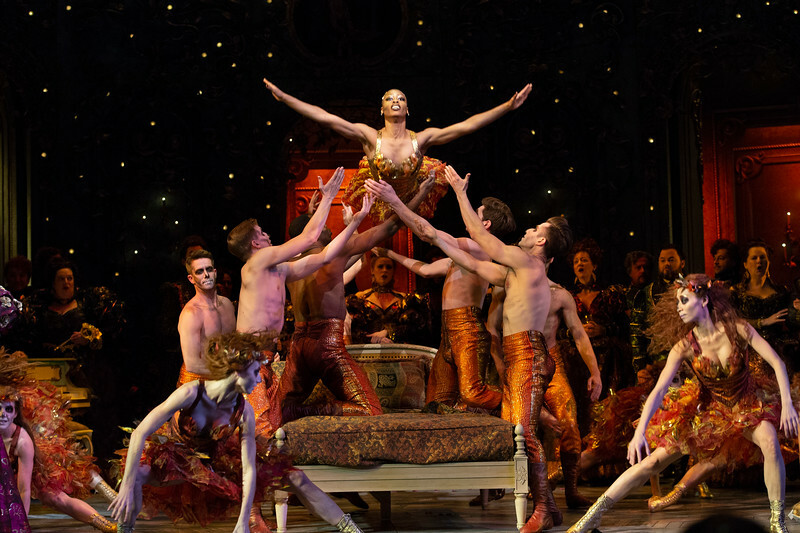 Both party scenes, Act I and Act II, scene II, have a colorful chorus choreographed by Lorin Latarro. In Act I the chorus performs in-synch gestures to the music, not excessively so, but just enough to let you know that it’s not random. The Spanish ballet in Act II, scene II has the mimed bull fight and all. This is highly energetic, like really highly energetic, enough to draw a gasp or two or several from the house at the end. Ultimately it’s far more interesting than swirling butts of the Baccanale of Samson et Dalila earlier this season. In the opening scene, visible during the prelude to Act I, Alfredo, distraught, lays his head beside Violetta’s lifeless body, all others, in mourning, are still. No big surprise: this forshadows the opera’s sad ending. But wait, who is the young woman? I should have looked at the program…We find out her identity in Act II: Germont doesn’t just mention the daughter’s upcoming wedding, he brings the pure innocent young girl along as additional emotional leverage. Okay, cool. But no need to have the daughter somnambulistically stroll across Violetta’s chilly Paris apartment in Act III in wedding attire with a bouquet. Passing right by her soon-to-be death bed? Really? Selin Sahbazoglu is Alfredo’s sister, present in the opening scene. Yannick Nézet-Séguin continues his path of enlightening revelations of scores we all know and love. Orchestral layers are more prominent, yet not distractingly so. In sum, Michael Mayer’s new production of La Traviata is certainly a welcome relief from the previous Traviata, though it is not a throwback to the old stand and deliver days we all remember well. Highly recommended, for Verdi of course, for the musicians of course, and it’s pretty, the production is pretty. A smile. Photos by: Marty Sohl; Act II, Scene II by Jonathan Tichler. Review performance: Tuesday, December 11, 2018, the 1,014th performance. *I’m kidding of course. More likely the flowers are because the designers know the story’s background: Violetta (in English, Violet) is based on Alexandre Dumas fils’ Marguerite Gautier, the Lady of the Camellias. Marguerite gives Armand a red camellia saying to return when it changes color; Violetta gives Alfredo a flower, asking him to return when it fades. Plus winter in Act III is characterized by a lack of floral color. Lots of eye catching colorful options in this production. Verdi’s La Traviata is performed in three acts with two intermissions. The running time of the HD performance is about three hours, ten minutes. Enjoy! My first Traviata at the Met was in June, 1970, with the beautiful Anna Moffo, the suave Carlo Bergonzi, and Mario Sereni. Memorable. Like yesterday.